Cream-style corn makes this buttermilk cornbread extra moist and flavorful. The corn also acts as a natural sweetener, though you can add extra sugar if you like especially sweet cornbread. 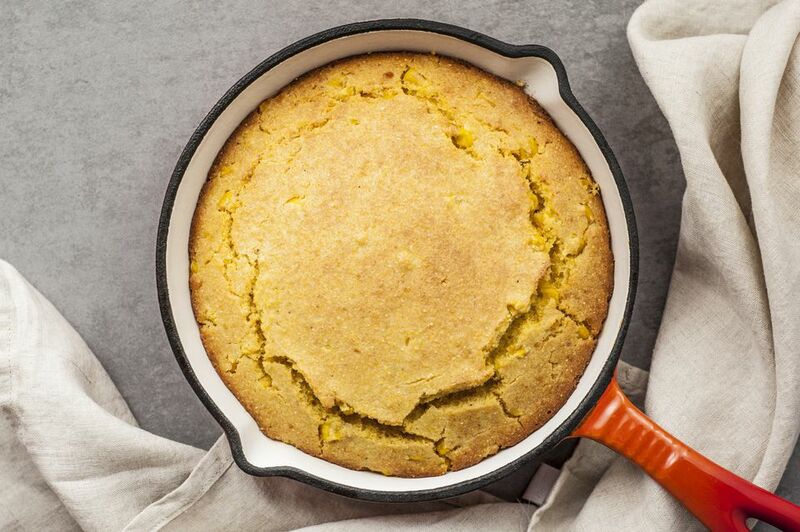 Serve this cornbread alongside a spicy chili, beans, or greens. Grease a 9-inch square baking pan or iron skillet. Heat oven to 425 F.
If you don't have buttermilk, measure 1 cup of milk into a measuring cup. Remove 1 tablespoon of the milk and replace it with 1 tablespoon of lemon juice or white vinegar. Let the mixture stand for about 10 minutes. For a bacon and cheese version, fold about 1/4 cup of crumbled bacon into the cornbread batter along with 1 cup of coarsely grated cheddar cheese. Optionally, add 1/4 cup of sliced green onions. For a spicy jalapeno cornbread, add 1 cup of coarsely shredded cheddar or pepper jack cheese and 4 to 6 tablespoons of finely chopped (seeded) jalapeno peppers.